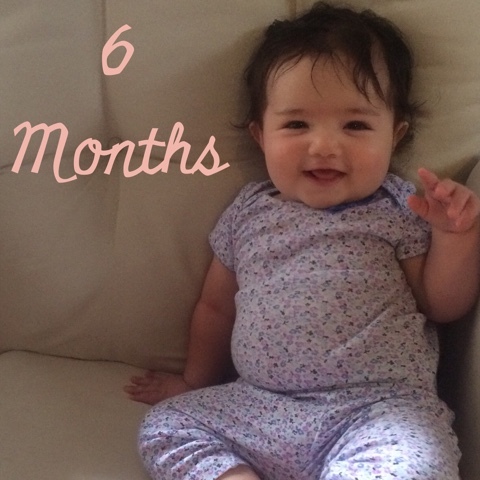 This week Alexandria the Great turned 6 months old. I can hardly believe it. Six months since her grand entrance. 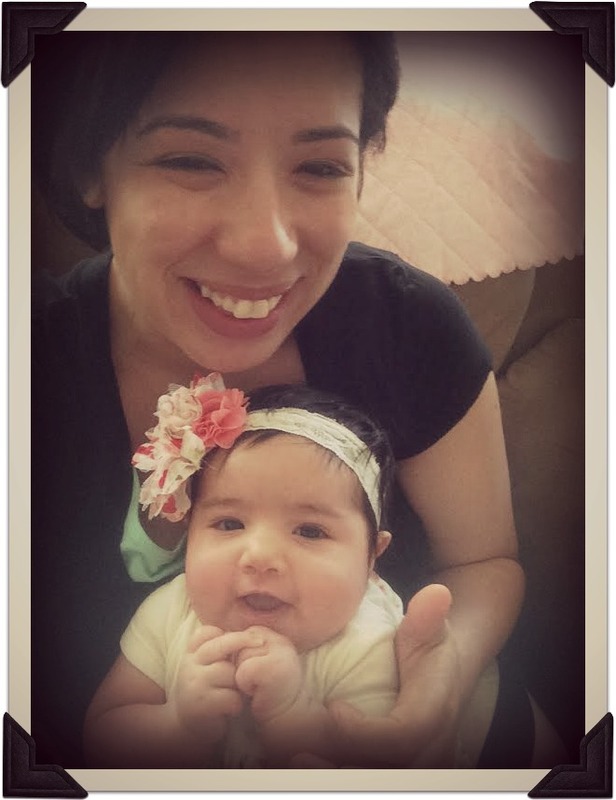 Six months of taking on the adventure of motherhood one day at a time. 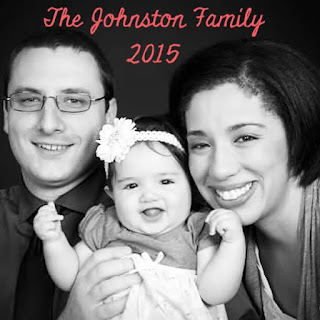 So in commemoration of making it halfway through her first year of life, I thought I would finally share her birth story…mostly for myself and for the ability to hopefully compare this to other Baby Johnston deliveries in the future. I was almost 41 weeks along, and I was tired of being pregnant. This was after walking up and down the most enormous hill we could find in town. 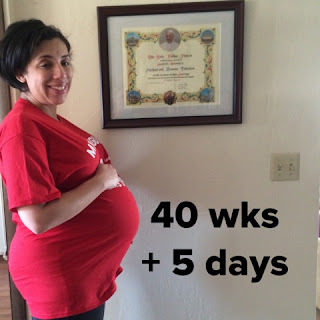 Sure, I understood that it was called an “estimated due date”, but when February 4th came and went and I still didn’t have a baby it felt like Christmas without any presents. Where was my baby? 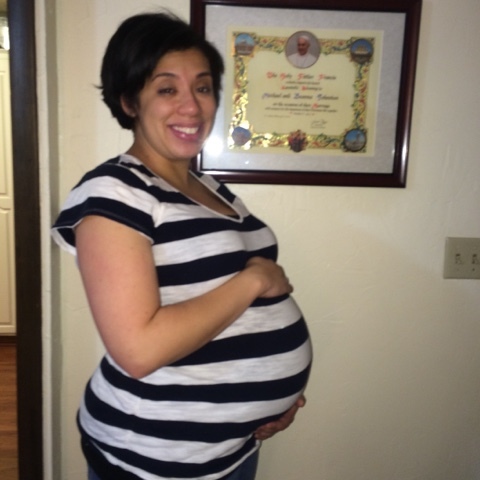 Baby Johnston was showing no signs of making an appearance any time soon. I was tired. I was sore. 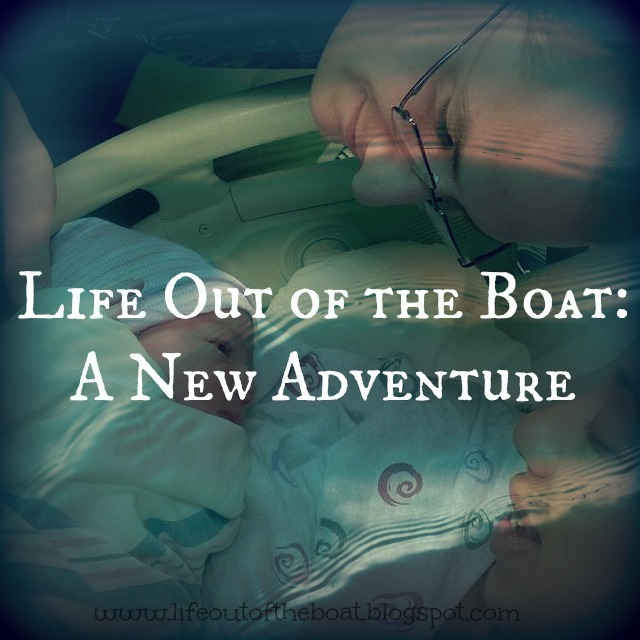 Sleeping at night was nearly impossible, heartburn was vicious as ever, and it felt like Baby J was nuzzling further up into my rib cage instead of making the journey south. I was enjoying Downton Abbey & Gilmore Girls marathons with Mom, but what I really wanted was my baby. And I was getting impatient. On the morning of Monday the 9th we went to an appointment with the doctor to discuss what would be best for me and for baby. We had originally scheduled an induction for that night, but we decided we were willing to wait a little longer. We asked Doctor P if we could go in on Wednesday evening to be induced, but when he told us he would be gone and would have to request another doctor, we decided to schedule the induction for Tuesday night, with the hopes that we would have a baby by Wednesday morning. Wednesday was the Feast of Our Lady of Lourdes, and that actually gave me a sense of peace as we moved forward. 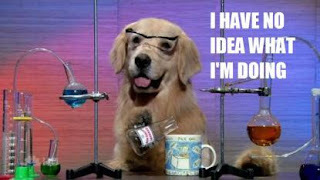 I finally got up around 5:45, and Mom wanted me to go walk the mall with her. Before leaving the house, we talked about what would happen if my water broke. I told my Mom about this article that had been my daily pregnancy email. “Oh don’t worry,” I said. “Only 15% of women’s water break before labor begins, so I think I’m good.” Mom commented on how surprisingly low that sounded, but we both agreed that the chances of my water breaking were so low that it wasn’t worth worrying about… plus after the appointment I’d had with the doctor that morning I figured I’d be pregnant forever until I was induced. Around 6:40pm we left the house, leaving my husband to cook dinner while we drove over to the mall across the street. When we walked into the store I noticed a rack of men’s pajama pants on clearance, and remembered that Michael needed another pair or two. I couldn’t remember his size so I gave him a call while my Mom went to another section of the store. And with that, I became one of the 15%! Feeling particularly grateful that I had changed out of my skirt and into my super absorbent yoga pants, I waddled to the back of the store, found Mom and informed her that it was GO TIME. I’m not sure if any of the JcPenny employees heard this exciting announcement, but after verifying that I hadn’t leaked all over their floor we got in the car and headed back across the street to pack things up for the hospital. The house is a mess! What is the baby going to wear when we go home? Heck, what am I going to name this baby? What if this baby doesn’t get the right name?! I’m hungry. I haven’t eaten since lunch.I can’t eat! I’m having a baby. But I should eat.But I can’t! Right about the time we were packing the car was also when those contractions kicked in. We got to the Women’s Center a little after 7pm. I’m not sure what I expected…maybe I’d seen too many TV shows or movies where the woman pulls up to the hospital and the nurses rush her to the delivery room in a wheelchair. I was surprised by how calm everyone was. I waddled my way to the delivery room, put on their ever so elegant hospital gown, got hooked up to the machines, and signed some paperwork. Doctor P came by around 11pm to check on things. Because Baby Johnston had already pooped in utero, he said that we really needed to get the baby out in the next 22 hours. This meant we needed pitocin to help me progress, which meant those lovely contractions that I thought I was handling so well were about to get a whole lot more intense. In hindsight, I really wasn’t prepared to have a “natural” childbirth. Sure, I’d read a few articles, glanced at a few books, but we didn’t really have a plan for dealing with the pain. Yes, I had my bouncy ball. We did the tennis balls in the sock thing to rub my lower back… And my husband did an amazing of helping me focus and breathe through each contraction. In fact, without his encouragement and gentle presence I couldn’t have made it as long as I did without drugs. 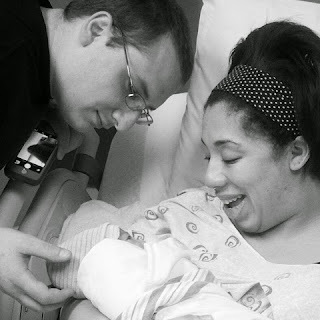 But after about 4 hours of tears, I knew that the only way we were going to progress was if we got the epidural. As the surprisingly peppy for 3:45am anesthisiologist prepped me, I felt really guilty. 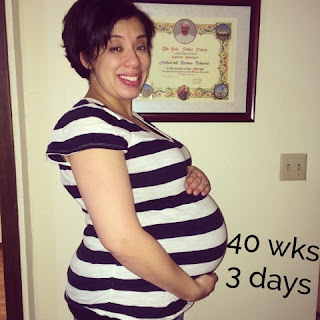 I thought about how much the epidural would add to our hospital bill, and I also felt like I had somehow failed by not pushing through the pain. And I’m pretty sure the heavens opened. 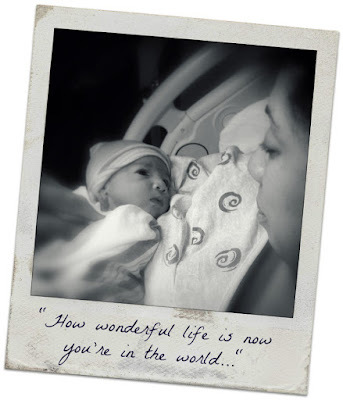 That epidural was the BEST decision I made for myself that day. As soon as the epidural kicked in I went to sleep. Just like that. I was relaxed enough that things could move along, and Michael was able to get some sleep as well. I woke up around 7:30am and I was still feeling really good and loving that epidural. My Mom came in to trade places with Michael so he could run home real quick to get something. Our home is 4 min away from the hospital so it wasn’t a big deal for him to leave. Let me mention here, my Mom is amazing. Not only did she stay in the waiting room praying throughout the night for us, but she was affirming and encouraging throughout the entire labor. And she even held my barf bag when Michael left, so she gets major points in Heaven for that ;). At which point I called my husband and told him to come back now. It was Go Time. Doctor P finally came in around 9am and the team assembled. Because of how alarmed the nurse had been during my practice push, I really thought that this baby was just going to slide right on out. Like maybe 2 pushes and boom, baby. Right? This is going to sound silly but I had no idea how hard pushing was going to be. You’d think I would have picked up on that… I mean I was pushing a human being out of me…kind of a big deal. 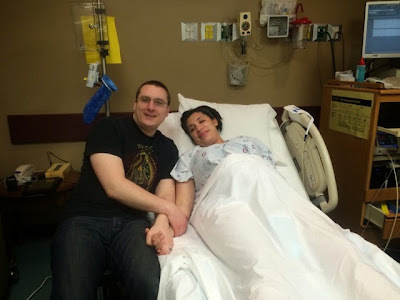 My epidural was just wearing off, so could feel enough pressure to push, but there wasn’t any pain. I had two nurses on my left, Michael on my right, and Dr. P ready to catch. I remember thinking that I had a “good” nurse and a “bad” nurse… but really they were both just encouraging me in different ways, and I needed both of them there. I pushed again. Something, but not enough. About 4 or 5 pushes and I realized this was going to be one of the hardest things I had ever done (Again, silly aha moment). Um.. call those the words of inspiration that I needed because with that, I pushed like I had never pushed before, and all of a sudden… I could breathe. The doctor had told me the night before that once baby came out they were going to need to suction the baby’s lungs before handing the baby to me because of the meconium. I’m really glad that he had prepared me for that, otherwise I probably would have been scared and worried that he wasn’t handing me my child immediately. It took a few moments for them to give her to me, but when we finally met, it was love at first sight. You can read about that moment over here. But long story short, meeting my daughter, seeing her for the first time, was like getting just a tiny snapshot of the infinite and miraculous love of God. One of the benefits of not knowing if “Baby Johnston” was a boy or a girl was that I felt like we could go to the hospital with options. We’d come up with our top 2 girl and 2 boy names, and figured once we met the baby we’d know. 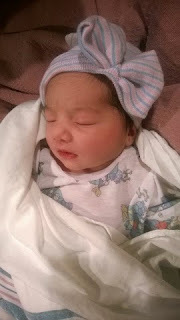 It took a little while, but we settled on Alexandria Elise. 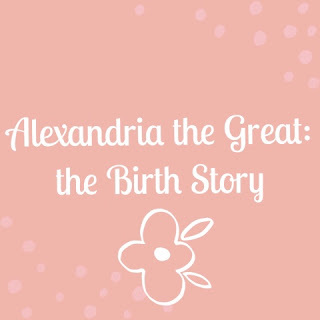 Alexander is the name of my Great Great Grandfather on my Mom’s side. I have a male cousin named after him, and I thought we might bring it back with a feminine touch :). And Elise? Well, that was a name that I happened to come across during a meeting with parents preparing to baptize their baby. I thought it was pretty. Boom. The meanings of her names are what I like the most. When I hear “Defender of Mankind” it makes me imagine how God will work through her as she grows. 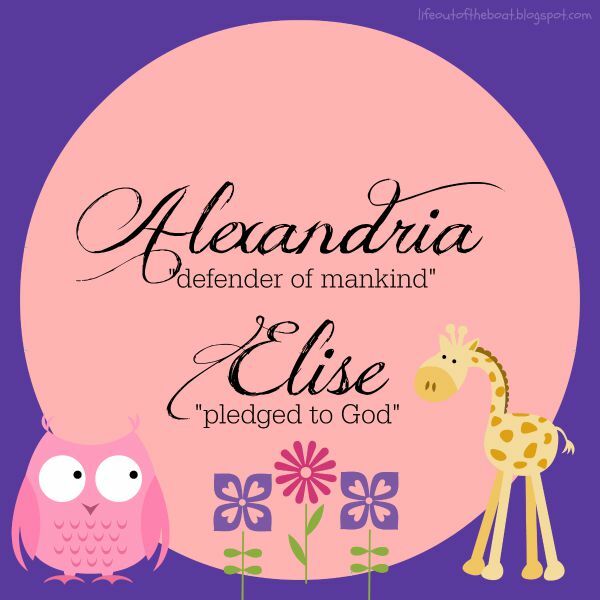 And the meaning of Elise, “pledged to God” reminds me that my prayer from day one has been that she will be the woman God created her to be. Usually the first question people ask me after I tell them her name is “What are you going to call her?” Five syllables is a lot for one kid, I know. Still, we call her Alexandria (the Great). It’s a big name, but I have a feeling it’s going to fit her just fine :). Some folks call her Alex, my family calls her Lexie, but her Dad and I will most likely always call her Alexandria…. 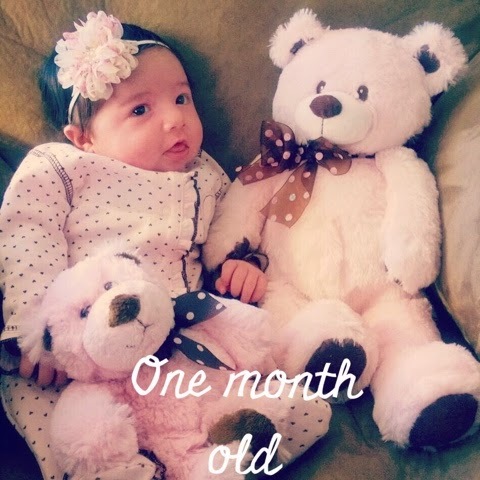 ….at least until we mix her name up with her siblings! 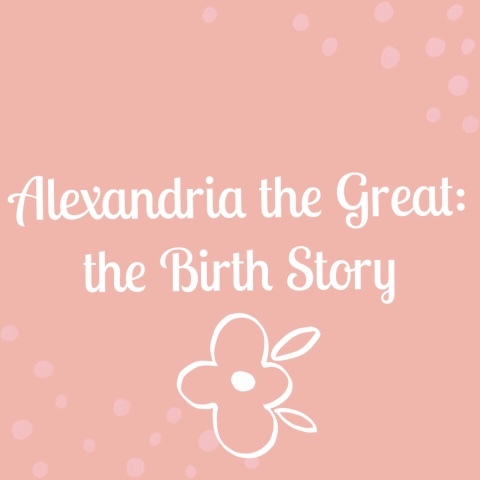 And there you have it, the story of how Alexandria the Great came into the world and got her name! and for trusting us with the great task of being her parents. I really like “Timehop” and the “On this Day” apps. It’s always entertaining and sometimes surprising to see a snapshot of what I was up to several years ago. One day I was scrolling through those memories and it occurred to me that a lot has happened over the past 10 years. 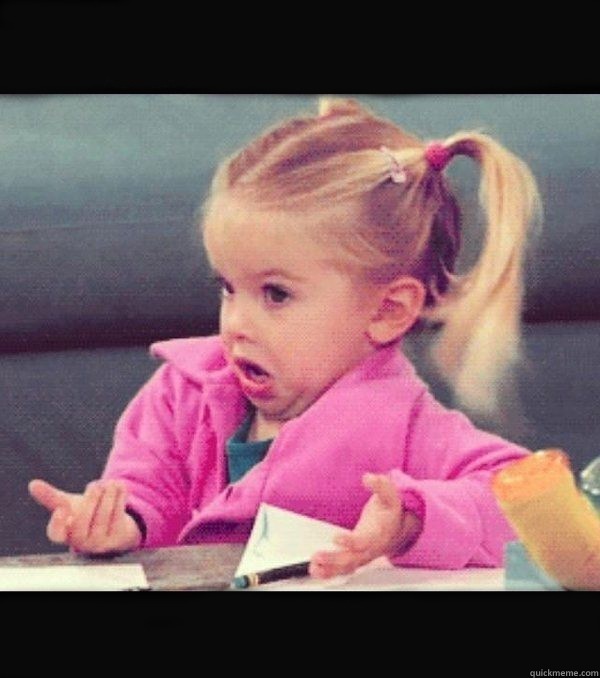 If you had told me at 19 years old that over the next decade I would travel to two other countries, live abroad for a year, get a job in Southwest Kansas, teach Theology of the Body in English and Spanish, marry a man I met on the internet, meet the Pope, earn a Masters degree in Theology, and then have a baby…. I probably would have thought you were insane. There’s just no way I would have been able to process all of that. 19 was a dark time for me. I was getting ready to go into my sophomore year of college, I was living at home, my Mom was dealing with a debilitating illness (which was hard on the whole family), and I was also struggling through some serious addictions and pain of my own. At 19, I thought my brokenness was only going to get more broken. Sure, there were good days. But I was hurting, and I was looking for happiness, love, and peace in all the wrong places. What I didn’t realize at the time was that while I thought my wounds were only getting larger, God was already at work doing some major heart surgery. When I look back at the last decade as a whole, I can’t help but see how God laid a foundation over the years, and how each step had an influence on the next. Of course, those are just the major highlights, but I know that there were even more moments and experiences that God used to draw me closer to Himself over the years. 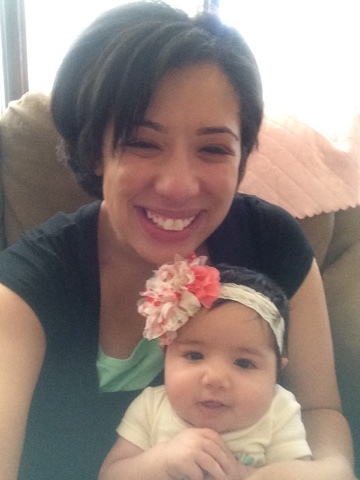 Now here I am at 29… a married mother in ministry. 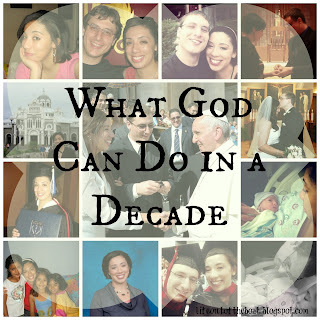 God used some of the darkest, most challenging, and most inspiring experiences lead me to where I am now. I’m still growing, I’m still in formation, and God is still faithful, even when I’m at my worst. I wonder if this life could really change at all. You make beautiful things… out of the dust. You make beautiful things…out of us. You make me new, you are making me new. God’s plan for our lives is more incredible than anything we can imagine for ourselves. If I’ve learned anything over the past decade, it’s that God will make something beautiful out of our brokenness, but we have to let Him into it. Sometimes it is really difficult to see the “bigger picture”, and it is easy to forget that God is at work in each and every moment. I still struggle with this. I don’t always remember to look at where I am in my journey or actively discern what the next steps might be. Yes, God can do so much over the years… but am I open to what He is doing in my life right now? Do I realize that if I’m willing to give God each day, one moment at a time, He can do the impossible? Maybe you’ve experienced a dark moment in your own journey. Maybe that’s where you are right now, and it’s hard to see hope or how God could possibly bring healing into the situation. If I can give any encouragement, it would be to be patient with yourself and be patient with God. God loves us too much to leave us exactly where we are, and He really can make something beautiful out of the darkest and most broken pieces of ourselves. There’s a little detail in this Sunday’s Gospel reading that made me pause and think about how I approach ministry. It’s one of the classic moments in the Gospels, where we hear about the Call of the First Disciples in John 1:35-42. Two of John the Baptist’s disciples decide to follow Jesus, which leads to Jesus telling them to “Come and see…”. Then Andrew, one of the two, goes and gets his brother Simon Peter and tells him “We have found the Messiah” and then he takes his brother to Jesus. And this is where I think it gets really interesting. It doesn’t say that Andrew took Peter to Jesus and then Jesus started preaching to the group. It also doesn’t say that Peter showed up and Jesus started rattling off orders of what he needed to do. Those words really made me think for a second. It’s such a small detail… I mean, you’d assume Jesus was looking a Peter when they met for the first time. But the fact that John 1:42 specifically says “Jesus looked at him“ before going on about the big moment when Jesus tells him what he is going to be called, makes me think that Jesus wasn’t so much concerned with pushing his own plans on Peter as he was focused on recognizing who Peter was. This is a skill that can be tempting to forget, especially when we’re involved in ministry of any kind. 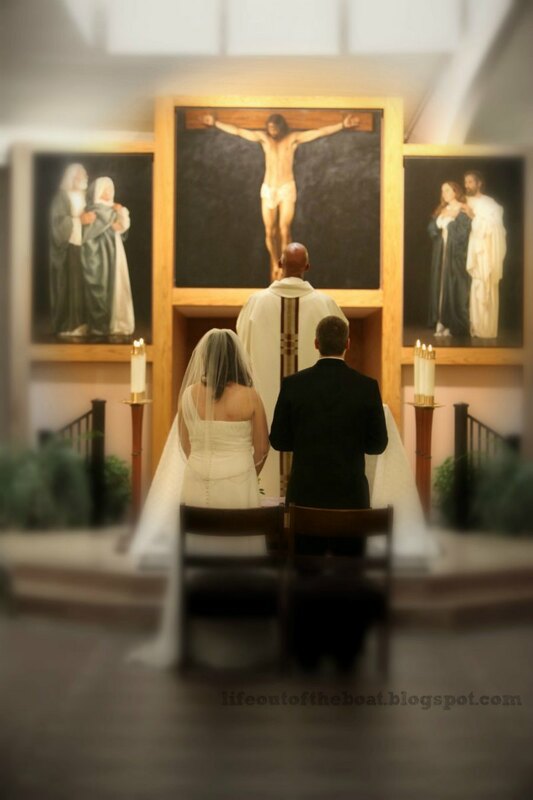 It’s easy to hear about someone’s situation and say “Oh well you just need to get your kid baptized…” or “You should get your marriage convalidated so you can return to the sacraments…”. It’s easy to tell people that “all they need is Jesus”, or that they just need to pray a certain prayer, or better yet that they just need to go talk to the priest, or counselor. And all of those things may very well be true! Sometimes we really do need to enthusiastically encourage people to get involved in the life of the parish and invite them to go deeper in their faith journeys. But before any of that can happen, we have to be able to see people. I know for myself working in full-time to ministry, there can, at times, be a temptation to just go through the paperwork for baptism or marriage preparation without ever really getting to know the people sitting in my office. It’s easy to fill out census forms, hand people checklists, and pass on my business card. It’s another thing entirely to step back and spend time getting to know who someone is, and listen to their story. When I think about the moment that Jesus looked at Simon Peter, I don’t think it was an awkward silence or stare down from Jesus before giving the poor guy a new name. I think was more like Jesus’ eyes met Peter’s, he probably gave one of those classic Jesus smiles, and Jesus’ heart was full of love and compassion for this new disciple for whom God had some pretty big plans. I mean, spoiler alert, he called him “Cephas” (which means “rock”). Jesus looked at Peter and all of the disciples as children of God first as foremost, which means he loved them as God does from that very first encounter. It makes me wonder, do I see people the way that Jesus does? Do I care about who they are and what their unique story is? Do I see them as children of God or do I see them as another person who needs another “thing” and then send them on their way? Honestly, there are moments where I fail big time in this area. A couple will show up 15 or 20 minutes late for their appointment, they will be gruff or short with me, and in the end I’m just happy to get the meeting over with. But then there are other times in which I really get to know a person or their family and I hear incredible stories. 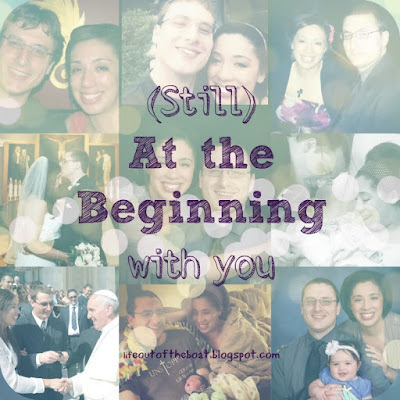 I get to hear stories like the mom who wasn’t coming to Mass every weekend, but her husband had died a few months earlier and she was finally at the point of functioning again and finding hope in her faith. Or the adults who grew up far away from any kind of faith life or spirituality and have discovered the beauty of the Catholic Church and are hungry for more. 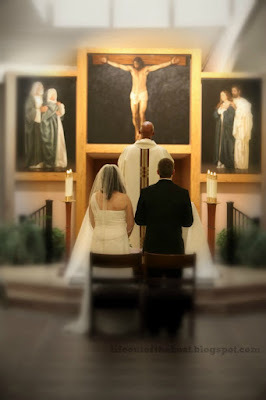 Or the couple who comes in wanting to start marriage preparation after decades of cohabiting because they have had an encounter with Christ through a retreat or prayer service and are longing for the sacraments. There are some inspiring and beautiful stories that I get to hear, often when I least expect it. But it requires taking the time to really see people, and to focus on who they are more than what I can offer them. Before we send people off to another formation program, or tell them to talk to a priest, or give them paperwork to fill out, we have to look at them. 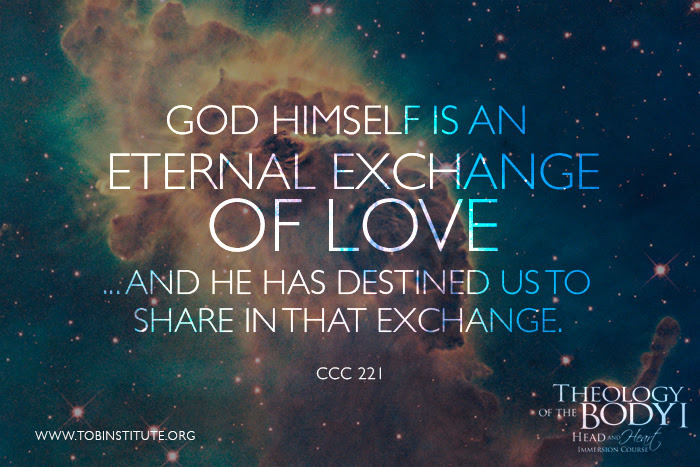 We are called to look at them, to love them and to hear their story. Sometimes what people need to hear before the checklist or form are pulled out is that we recognize who they are as a brother or sister in Christ and that we care. Lord, teach us how to look at others. and to love them as you love them. Give us the eyes to see, the ears to hear, and the heart to love.